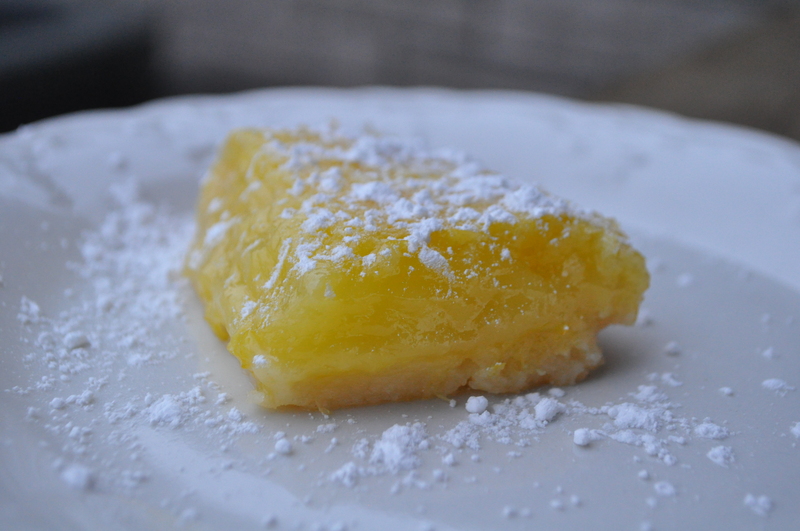 Here is the first recipe I made using my Homemade Limoncello. It turned out pretty tasty. I plan on a part 2 post; I just haven’t gotten around to it yet. So much has been going on this summer. It’s hard enough to get a blog post up some day. Good thing I like the blog world and all it’s lovely people so well! In a large bowl, combine the first 6 ingredients. Marinade the cod for an hour. Grill over medium coals until flaky. 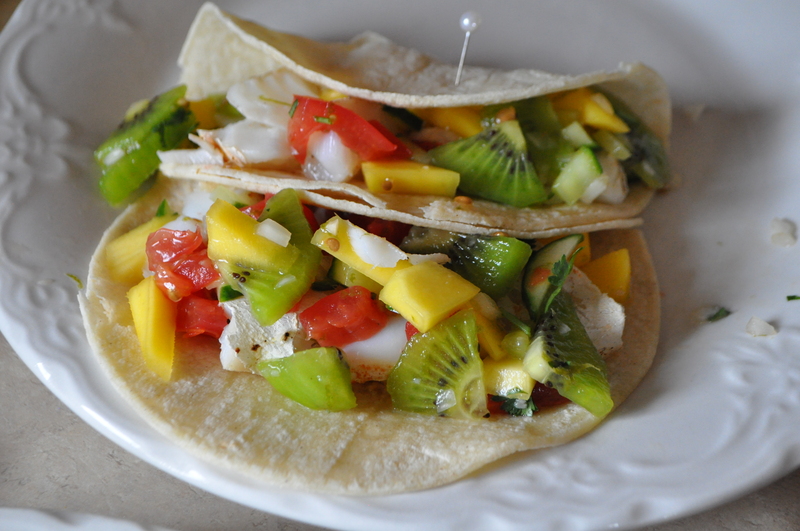 Serve with the fish salsa in corn or flour tortillas. In a bowl, combine all ingredients. Allow salsa to chill and the flavors to meld. Serve over the fish. I am desperate for a bit of summer. The warmth soaking into your bones. The fresh produce. The smell of freshly mowed lawns. The cheeping of happy birds. The bright colors of newly bloomed flowers. Even though Punxsutawney Phil predicts the quick arrival of spring, it seems so far away. 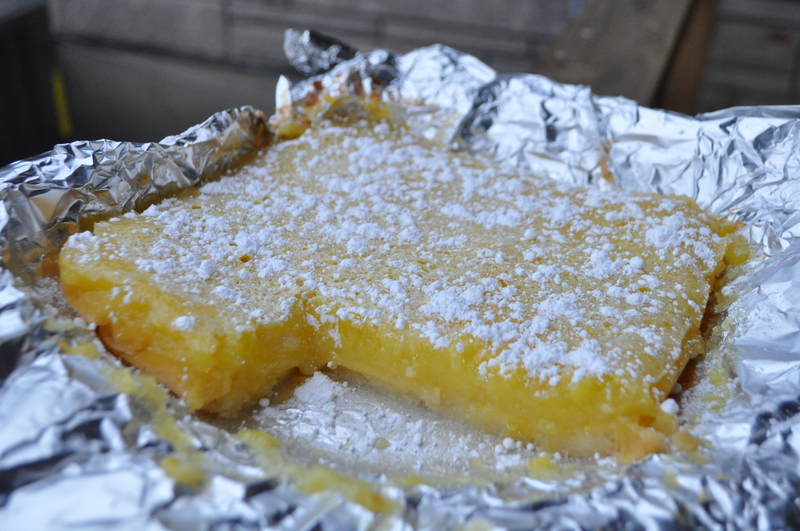 Lemon bars with their dusting of powdered sugar are served regularly at summer picnics, church homecomings, and backyard barbecues. If I can’t have the warmth and outdoor fun, I guess I’ll just have to settle for the flavors. Preheat oven to 350 degrees. Line 9×9-inch baking pan with non-stick aluminum foil. In a large bowl, combine flour, sugar, and salt. Cut butter into small chunks and add into the flour using a fork, mixer, or food processor (which I used). A dough ball will form. Be sure the butter is mixed into the flour well then press into the pan in an even layer. Bake for 18 minutes or until the edges are slightly browned around the edges. In another bowl, whisk together the eggs, lemon zest, sugar, and lemon juice. Remove a few tablespoons of the mixture to whisk into the flour. When it is smooth, add to the rest of the filling, whisking to combine. Very gently pour the filling into the crust and bake for 20 minutes or until the filling is set. Cool completely before you cut the bars. Top with confectioners sugar. 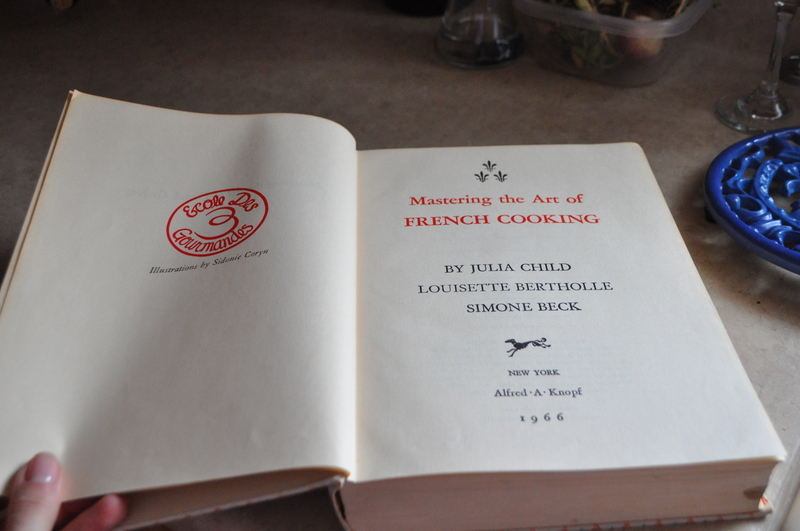 … is an exciting used book store find – Mastering the Art of French Cooking Book 1 by Julia Child, Louisette Bertholle, and Simone Beck. I got it for a stunningly cheap $14.50 and just had to have it. This month I hope to read it through cover to cover. It does such a wonderful job telling the reader the practical reasons behind why we do what we do in the kitchen. 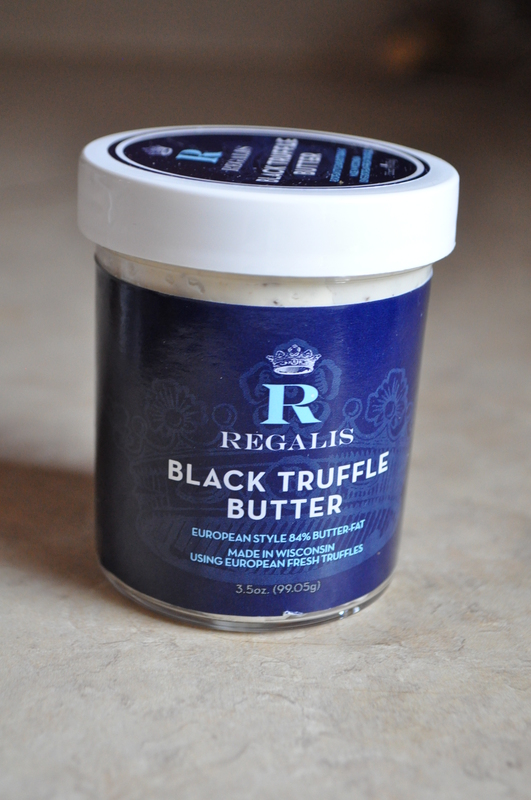 … is a little tub of black truffle butter. I have yet to find a recipe worthy of it’s awesomeness. I want the butter to be the star of the recipe. Any ideas? … is a Minneola tangelo. This little baby is a new variety carried by my grocery and is a cross between a tangerine and a grapefruit. I just had to try one. 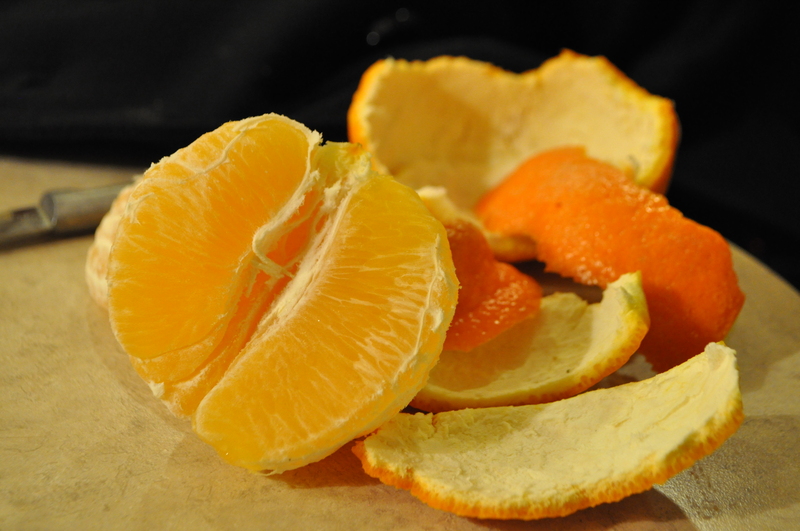 Characterized by an easy to remove peel, this citrus is sweet with only a mild tartness. Best of all- no seeds! Sorry this month’s In My Kitchen is so short. There are a bunch of new ideas but nothing tangible enough to photograph. Stay tuned for future awesome posts devoted to NOLA cuisine and bachelor friendly food. 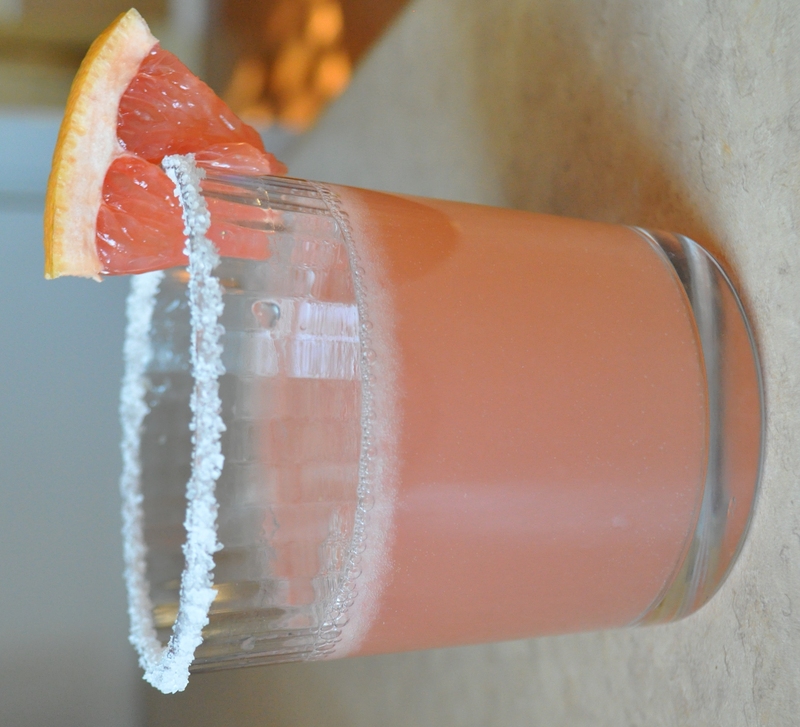 Thanks for stopping by and be sure to check out figjamandlimecordial for more In My Kitchen posts. 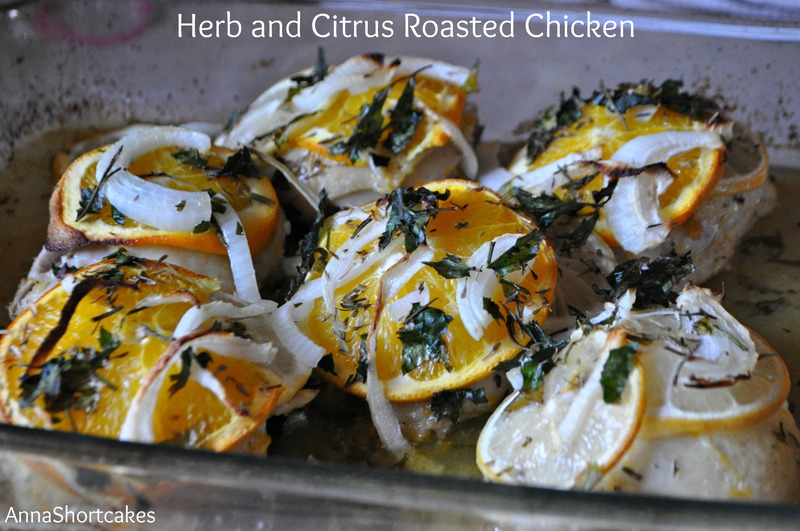 I have always seen chefs use fennel but have never really had a reason to try it at home. When I saw this salad, I thought it sounded seasonal and crunchy, a perfectly refreshing winter salad. I love the crisp texture of the fennel with it’s subtle licorice flavor. I can’t wait to use them in even more ways. And apparently they are easy to grow… One bad thing about winter- the garden you imagine for next spring becomes unreasonably large. In a dry saute pan over medium heat, toast the fennel seeds for a few minutes until the aroma is nicely released and they change color slightly. Combine fennel seeds, olive oil, balsamic vinegar, and sea salt in a small bowl and whisk to mix. 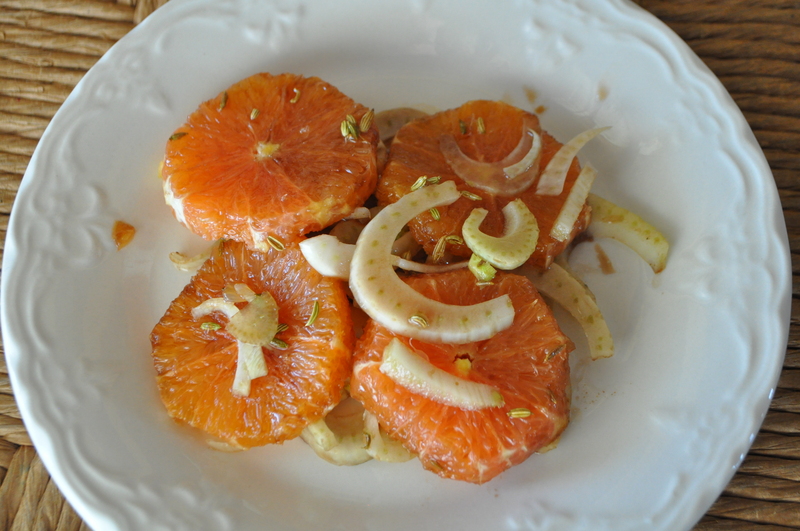 Arrange the orange slices and fennel on your plate. Spoon dressing over the layers. Serves 2. 2012 was a year of growth. 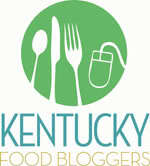 Growth of this blog – AnnaShortcakes reached 20,000 views and featured 253 new posts. My cousins and I at Big Ed’s Pizza in Oak Ridge, TN. Growth of this novice chef – I tried new things like wine tasting, smoking meat, canning Pear Vanilla Jam and Lemon Curd, gardening on my own (normally done with my extended family), and traveled to new places like Mount Vernon, Virginia and Harper’s Ferry, West Virginia. I can’t wait to see what the New Year holds. 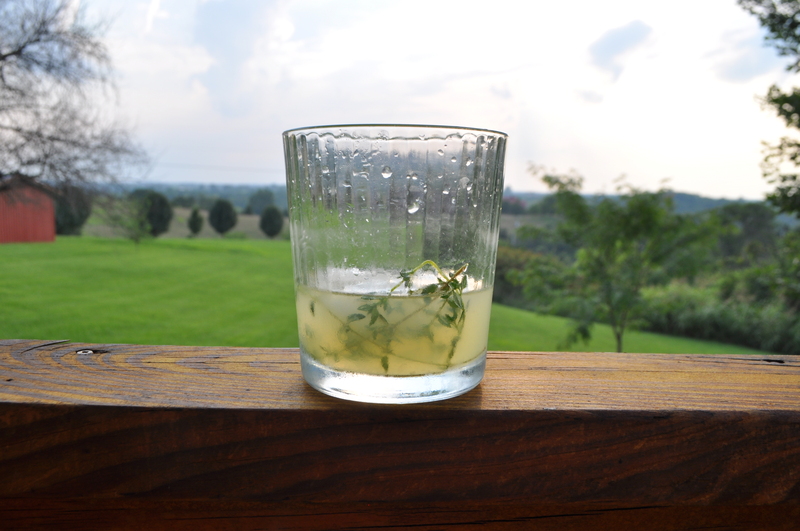 I am adding a new monthly post called “In My Kitchen” inspired by Fig and Lime Cordial‘s Celia. I have already added a Twitter account; you can follow me at @annashortcakes. I also plan to travel more, try new foods, and continue my search for fantastic new recipes. … is the KitchenAid Stand Mixer Attachment Pack that includes a slicer, a grinder, and sausage stuffer attachment. A gift from my thoughtful hubby. I cannot wait to try it out. If you have meat you want fresh ground, we can go halves on the meat. I hope someone brings me a deer carcass. I am going to use the grinder to quick chop all kinds of summer vegetables to speed the canning process for my mother-in-law’s tomato soup recipe. … is a gorgeous Pampered Chef baking stone. Thanks to my in-laws for this awesome gift. I can’t wait to bake like crazy! … is a bowl full of real Florida grapefruit. Picked by a family friend from the tree in their yard, these grapefruits are way better than any you might buy in the store. And the uglier they are, the better they taste. … is a bottle of Cranberry-Lime Infused Vodka ready for me to buy the limeade concentrate so we can try the crantini. What is in your kitchen this month? Don’t you wish this was your Christmas gift? I can’t wait to open a jar. I want it over pound care with raspberry syrup…. MMMM!!! 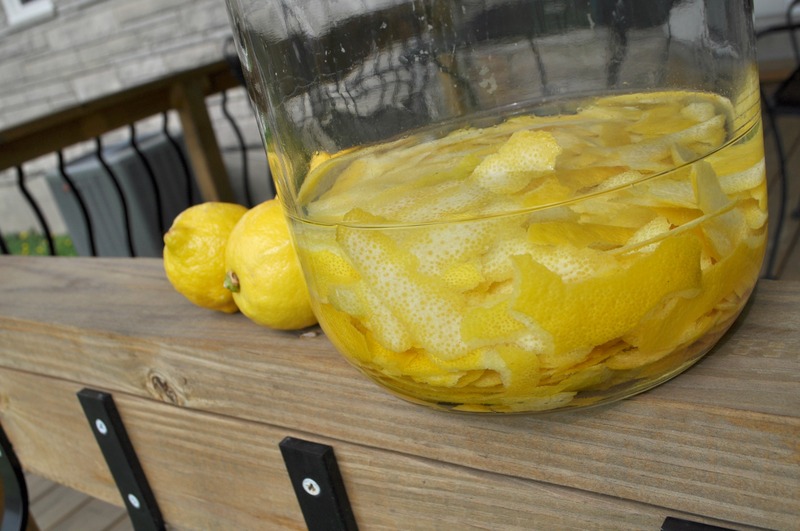 Soak your citrus in a 4:1 combo of water and vinegar to help remove all that funk and some of the wax that may be on the fruits. Dry with a towel. Using a zester or a microplane, zest each fruit, avoiding the pith as it is bitter and will ruin the flavor. Juice each lime. If you have a double boiler, heat it up. Since I don’t have one, I used a cobbled together version; you can place a metal bowl over a sauce pot. Make sure that the water in the sauce pot is enough not to boil dry but not so much as to allow the water the hit the bottom of the bowl; the idea is to cook with steam. Before you put the metal bowl over the steam, combine the sugar, whole eggs, egg yolks, salt, and lime zest. Mix thoroughly with a whisk. Place on top of boiling water. Continuing to whisk, add in lemon juice. Whisk whisk whisk until combined, then add the melted butter. Continue whisking the mixture until it reaches 170 degrees F on your candy thermometer. Remove the metal bowl and place on a hot pad or trivet; be careful because the bowl is hot. One ladle at a time, strain mixture through a fine mesh strainer to remove the zest and any seeds that might have gotten away. To can the lemon curd, sterilize the jars, rings, tongs, and ladle in boiling water for 10 minutes. Remove the hot jars to a kitchen towel, and fill with hot lemon curd, leaving a 1/2″ head space. While filling the jars, soak the new lids in the hot water. Wipe the rims, top with the lids, and screw the rings down finger tight. Set the filled jars on the rack inside the stock pot. Make sure the water covers the tops of the jars by at least one inch. Turn on the heat, and bring the water up to a boil (covered). Once boiling, let the jars process for 15 minutes. Carefully remove the jars from the water and place on a dish towel. Allow to cool. As the seal, you will hear that lovely little ping, indicating your hard work has paid off. Use home canned curd within 3-4 months, separation or color changes may occur with longer storage and indicate it might be bad. Makes 9 half pint jars.